THIS EVENT IS FULL! — Family Night for children in kindergarten through third grade will be held at 6:30 p.m. on Monday, April 8. This is the final family night for this school year. 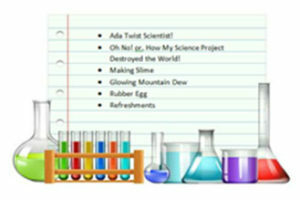 We will be reading the book Ada Twist, Scientist! and Oh No! or, How My Science Project Destroyed the World, performing science experiments, and enjoying refreshments. Space is limited and reservations are required. Save your space by filling out the reservation form below, or by calling the library at 471-4140.